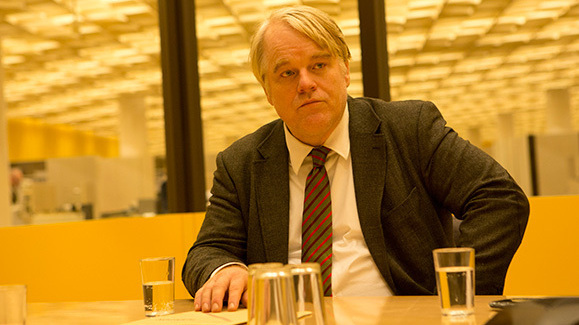 Movie Review: A Most Wanted Man One of the final performances of Philip Seymour Hoffman comes in the strong John le Carre adaptation. Philip Seymour Hoffman stars in A Most Wanted Man, director Anton Corbijn's adaptation of John le Carré's 2008 novel, as German intelligence officer Günther Bachmann. Islamic immigrant Issa Karpov (played by Grigoriy Dobrygin) and American social worker Annabel Richter (played by Rachel McAdams) get caught up in Bachmann's plan to prevent a national security threat. Fittingly, one of Philip Seymour Hoffman's final performances is in a movie about role-playing. The masterly actor mutters and growls his way through A Most Wanted Man as a spy who's simultaneously fighting two losing wars: against the West's enemies as well as his own putative allies. Further deepening the movie's ambiguity, the American actor plays a German in a story whose payoff is pungently anti-American. Although set in Hamburg rather than London, this is familiar turf for John le Carre, whose 2008 novel is the movie's source. Dutch-British director Anton Corbijn's adaptation of A Most Wanted Man is thematically linked to, and almost as good as, Tomas Alfredson's film of Le Carre's Tinker, Tailor, Soldier, Spy. Both are painstaking, rueful accounts of men who try to outthink a poisonously irrational world. Le Carre placed the story in Hamburg because that's where the 9/11 attacks were planned. The city has been on "high alert" ever since, an opening note explains. So the people who pay attention to mysterious newcomers are intrigued when a desperate-looking Chechen, Issa Karpov (Grigoriy Dobrygin), slinks out of the Elbe River. Word of his arrival quickly reaches Gunther Bachmann (Hoffman), who runs a secret counterintelligence unit whose operations are ostensibly banned by German law. In the mode of Peter Falk's Columbo, Gunther is disheveled and seemingly impulsive, yet actually methodical. Gunther begins by speaking German but quickly switches to accented English, an old Hollywood trick that works here because Hoffman and the movie's other native Anglophones — notably Rachel McAdams and Willem Dafoe — don't overplay the Teutonic inflections. Their tones never clash with those of Nina Hoss and Daniel Bruhl, actual German stars in supporting roles. The assumption is that Issa wants to contact Islamic terror cells in Hamburg. Instead, he moves in with some new acquaintances, who refer him to a human-rights lawyer, Annabel Richter (a blonde McAdams). After seeing Issa's scars from Russian torture, Annabel begins an application for political asylum. It turns out that Issa has the key to unlock a multimillion-euro inheritance from his hated father. The money is in a bank, run by Tommy Brue (Dafoe), whose operations are not strictly legal — just like Gunther's. Issa wants to give the tainted legacy to respected Muslim pundit and philanthropist Dr. Faisal Abdullah (Homayoun Ershadi). But Faisal himself may not be entirely legit. Gunther plans to, as they say in paranoid thrillers, follow the money. But Berlin-based Dieter Mohr (Rainer Bock), who runs the country's officially acknowledged counterterrorism group, would rather arrest Issa straightaway. Somewhere in between, it appears, is icy CIA agent Martha Sullivan (a brunette Robin Wright). While Gunther would prefer not to deal with American spies, Martha's presence gives him more time to track Issa and Faisal. And Gunther and Martha develop a grudging rapport, illustrated by the way each offers the same half-ironic explanation for why they do the jobs they do. Condensed by Australian scripter Andrew Bovell (who's probably best known for Lantana), A Most Wanted Man retains a cogent narrative and le Carre's weary outlook. Rather than choke the narrative with details, the filmmakers keep the story lean while adding evocative visual and aural details. Corbijn, a former Brit-rock video maker, has a little fun by dropping Gang of Four's "To Hell With Poverty" into a bar scene and giving a small role to soundtrack composer Herbert Gronemeyer. But the look of the movie, shot in Hamburg and Berlin locations by the great Benoit Delhomme, is serious and authentic. If A Most Wanted Man is a parable, it's one placed firmly in the real world.